A little collaboration I did with @thetravellingypsy . She shot it while in Saigon and I did the editing. This quaint café has this polished industrial look with the white subway tiles on the walls, black and white mosaic floor, marble and wood tables and industrial steel chairs and stools. Plastic isn't in their vocabulary. This location overlooks the city and all the mopeds from the balcony. This shop is located in District 1 on Lê Lơi boulevard where there is the main Bến Thành Market where tourists look to get local handicrafts, textiles, and souvenirs. After a hot day of bargaining, this café is a cool retreat. They have the usual european coffee drinks, but what differentiates Saigon from other coffee cities is the Cà Phê Sữa Đá (Vietnamese Iced coffee with condensed milk). Make sure you ask for the filter other wise it comes pre mixed. After Tokyo, TheTravellinGypsy and I took to the Shinkansen (bullet train) Hikari to ride to Kyoto. It was about 2 hours and 47 mins ride. So the night before, we packed up some snacks and drinks and headed to Tokyo Station. While there, we spotted a bento box seller with different varieties to choose from. Kyoto Tower from the train station. In Kyoto, the subway system isn't as dense as it is in Tokyo. So people out here take the bus. The bus system runs quite frequently and the wait for the next bus if you missed yours is about the same time as it is for the train in Tokyo. 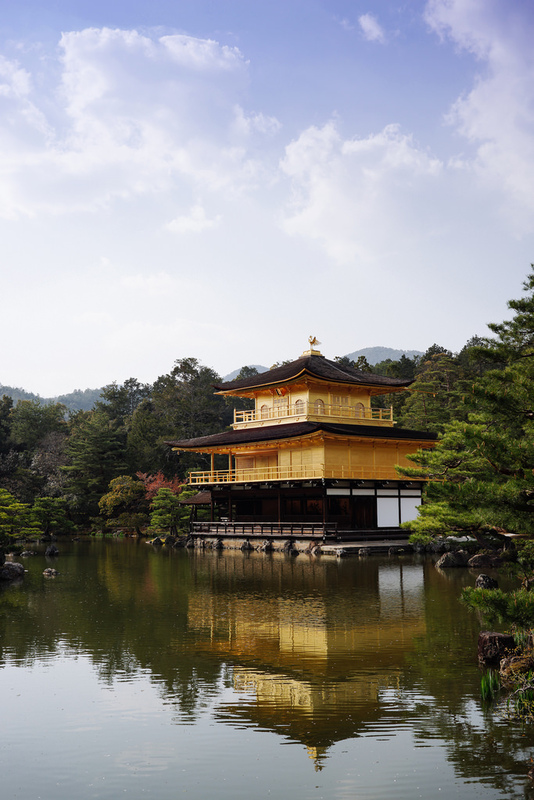 We took the bus to Golden Pavilion ( Kinkaku-ji ) which was about a 30 min bus ride from Kyoto station. We came from the Golden Pavilion to the Nijo Castle. The castle was closed until 1800 for the night viewing, so we bummed around the area and found a ramen shop. This looks like Kotteri style ramen where they shake the pork fat into soup making it extra rich. Inside Nijo Castle, the cherry blossoms were either fully bloomed or almost done. The closer they were to people, they were less sparse since people would grab the branches. The blossoms ranged from white to a deep pink. The next day we were in Gion where the geishas usually would traditionally go from tea house to tea house. Anna rented a kimono to wear and got her hair done up. only $70 for the rental and hair styling! Temple for unknown soldiers in World War II. Gion, Kyoto, Japan. Wandered Maruyama Park and ate at various food vendors. Pan fried pork buns. ¥600. From the entrance to the temple and Maruyama park and Gion ahead. Final day in Kyoto, we went to Fushimi Inari-taisha shrine and climbed the mountain underneath the torii. from wikipedia: Since early Japan Inari was seen as the patron of business, and merchants and manufacturers have traditionally worshipped Inari (god of rice). Purification fountain near the shrine's entrance. Had a chance to go visit Japan during cherry blossom season and it was beautiful to see all the blossoms in bloom. Though it wasn't as prevalent in Tokyo as it was in Kyoto, it was still amazing to see. My travel partner: TheTravellingGypsy and I scoured the city for food. Even though we didn't pre plan where to go eat, every place we did end up, was delicious. We typically looked for places with lines and some places we went looked questionable ie: tight alley ways. We did Tokyo for 4 nights and 2 nights in Kyoto. Yoshinoya in Japan is amazing vs in the USA. Back home, the sauce is thin and flavorless and apparently they haven't heard of green onions either. Walk to Meji Jingu Temple in Shibuya. The family in the kimono was visiting the temple and became the attraction.